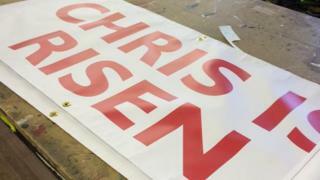 A church was presented with signs reading "Chris is risen" after a mix up at the printers. Acomb Parish Church, in York, had ordered four banners saying 'Christ is Risen' but the 'T' was missed off the finished article. However, assistant Curate Ned Lunn said the error was discovered before the signs were delivered. Mr Lunn said: "I'm so glad the customer spotted the mistake. It'll save a bit of embarrassment and a lot of confusion. "I had to check the four banners when I distributed them though, just to make sure. "The pastor at the Baptist Church is actually called Chris and he's got to get up for a sunrise service at 6.30am on Easter Sunday. "His predecessor didn't manage to get up for the service last year."